Prime Minister Malcolm Turnbull speaking at the Launch of the Prime Minister's Veterans' Employment Program at Kirribilli House, Sydney on 17 November, 2016.Image via Commonwealth of Australia, Department of Defence. Nominations for a new national awards program that recognises veterans and their employers are closing soon. 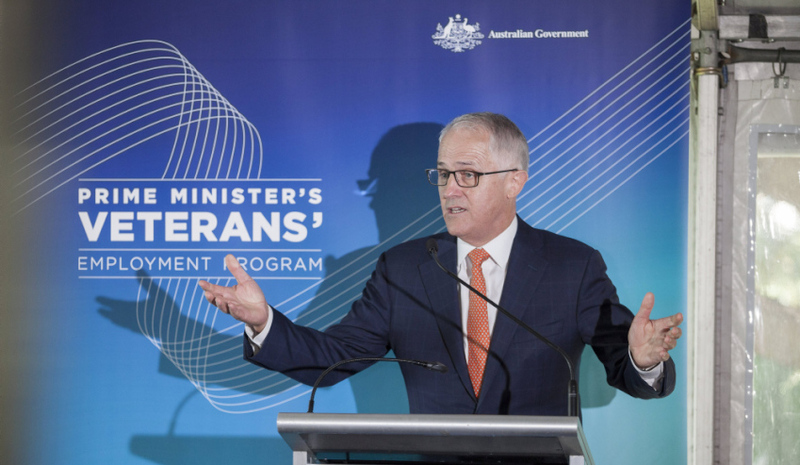 The inaugural Prime Minister’s Veterans’ Employment Awards will celebrate Australian businesses employing veterans, as well as veterans who are making a significant contribution to their workplace. The program has been established as part of the ongoing Prime Minister’s Veterans’ Employment Program. Nominations close on 22 December 2017. The winners will be announced at an award ceremony in Canberra in March 2018, attended by the Prime Minister and other members of government. Demonstrated excellence in recruitment, hiring and onboarding veterans into their work places. Innovative approaches to marketing and “reach out” to attract veterans to the organisation. Influencing and advocating the recruitment of veterans by other organisations. Demonstrated commitment to employing veterans, as evidenced by policies that support the recruitment of veterans. Demonstrated excellence in the management and retention of veterans through innovative training programs, ongoing mentoring and engagement programs. Demonstrated commitment to employing veterans as evidenced by the relative number of veterans in the workforce. Policies that support veterans’ employment. Demonstrated excellence in support provided and outcomes achieved. Evidence of client (veteran) satisfaction with service. Demonstrated excellence in attraction, recruitment, hiring and retention of military spouses. Demonstrated commitment in supporting military spouses’ careers through serving members’ postings, deployments etc. through policies, support services and mobility programs. Evidence of collaboration with ADF support organisations (Defence Families Australia, Defence Community Organisation, Department of Veterans’ Affairs etc.) to develop a robust and sustainable support model for military spouses. Two awards will be presented that are not open for nominations, The Outstanding Contribution by an Organisation to Veterans’ Employment and The Outstanding Contribution by an Individual to Veterans’ Employment.